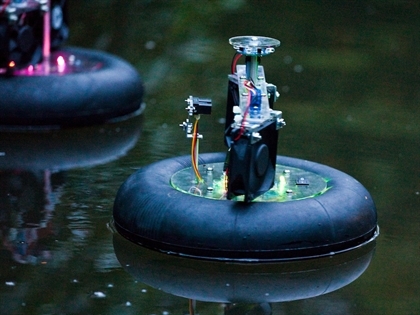 Vessels is an installation consisting of a group of water robots that display swarm behaviour. The collective behaviour of the robots show similarities with living creatures’ swarm intelligence. Together they create a simple ecosystem with and within their environment. Sofian Audry creates computational artistic works through different forms such as robotics, electronics intervention, interactive installations and net art. Sofian is currently a Postdoctoral Fellow at the Massachusetts Institute of Technology. He is actively involved in his community as part of artist-run center Perte de Signal which he led as president of the board in 2009-2017, and as lead developer of open source video mapping software MapMap. His work has been presented in Canada, Europe, Asia and Africa in many festivals and exhibitions. Samuel St-Aubin has been part of the electronic arts world since 2002. He has helped produce the work of a number of Quebec artists and collectives. For the past few years, he has been focusing on his own creative efforts. The electronics technician reinvents everyday objects. He injects another dimension into his creations that goes beyond the utilitarian reality of the object, by diverting them from their primary purpose, radically disrupting our relationship with the object. With unflinching precision, his works let us tap into the poetry of the everyday, discovered in the simplicity of existence.